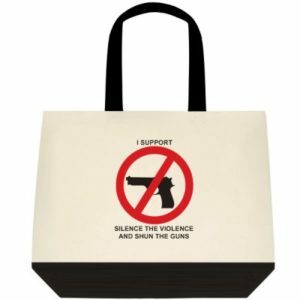 The Silence the Violence and Shun the Guns two-tone tote bag is an excellent replacement to carry your belongings or groceries. A consistent conversation ultimately leads to results. Visit the main Facebook page: www.facebook.com/silencetheviolenceandshuntheguns/ or the Canadian Facebook page: www.facebook.com/silencetheviolenceandshunthegunscanada/ to see the entire line of items. Buy here!